The previous week’s rally continued into Monday, with SPX, DJIA and NDX all hitting fresh peaks, particularly with energy stocks, as Oil rose at one point by 3.5%, and settled at 2.82% up on the the day, on uncertainly surrounding the surprise Saudi corruption crackdown, where dozens of billionaires and princes were arrested. Tax cut anticipation also helped. FTSE was also slightly up, although the non-oil indices DAX and NKY remained flat. The Saudi situation (and Fed Dudley’s retirement announcement) was seen as risk-off in currencies and Gold and JPY were up. CAD followed Oil of course, helped by the PMI beat at 1500. Following the Australian inflation beat at 0100, AUD (and GBP) were also up against the dollar, and 10-year US bond yields were down 3bp at 2.32% on the day. It was Turnaround Tuesday again for indices. US indices again touched intraday all-time highs, but pulled back and ended the day down, as the tax plan was delayed another day, and another Saudi issue, a spat over Lebanon was reported. Oil gave back a little of Monday’s gains. DAX and FTSE also pulled back but NKY carried on advancing. After RBA rate decision at 0330 completely gave up Monday’s gains and more. Indeed the turnaround applied across the board to the dollar, which advanced against all currencies, after beats on US data such as JOLTS Job Openings (1500) and Consumer Credit (2000). Only GBP held its own after an early dip, to finish the day flat. As you would expect therefore, Gold was down and bond yields were up. 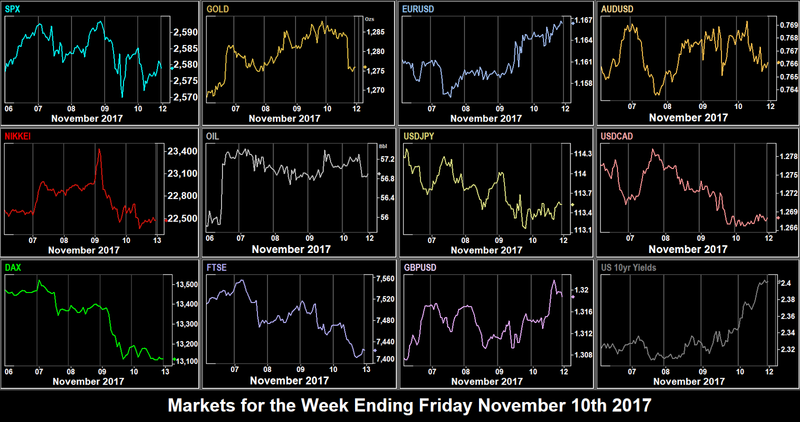 Wednesday saw the rally resume and SPX made another all-time high as did NDX on a tech stocks rally, whereas financials retreated on concerns about the details of tax reform. The mood was less strong elsewhere but NKY, DAX and FTSE all made gains. Oil pulled back again after the EIA miss at 1530. The tax issues also weighed on USD, which lost ground again all currencies. NZD was particularly strong, putting on 50 pips (0.73%) after the rate hold at 2000, and press conference at 2100. Gold rose in line, but surprisingly bond yields were actually up half a basis point on the day. The euphoria collapsed on Thursday. In Asia, NKY briefly rallied to a quarter-century high of 23420, then gave up 1,100 points (4.69%) by the middle of the US session. NKY has of course put on 22.3% in the last 10 weeks. European stocks had their worst day for four months with DAX down over 200 points (1.5%), despite the Trade Balance beat at 0700. FTSE was also down. The mood was reflected in the US, at one point the SPX was down 1%, although it recovered to finish 0.25% down on the day. The general consensus was that this was due to failure to make progress on tax, as House Republicans released a draft bill which differed from the original proposals, in particular that the proposed corporation tax cut from 35% to 20% may be delayed until 2019. Of course, simple profit-taking may have played a part. USD followed the mood, and was down 0.5% against JPY and 0.4% against EUR. The other currencies followed suit, and Gold was up. Once again, however, bond yields disconnected from USD, and were up. Oil was up again as Saudi political developments unfolded, and the Brent-WTI spread, which had been falling, started to rise again. Saudi Oil is traded at the Brent price. 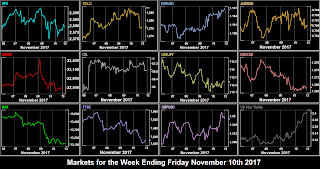 Friday was a US public holiday (the observance of Veteran’s Day, which falls on Saturday this year), and although US markets were open, trade was subdued, and as you might expect, there was more volatility in ES futures during the European morning, than in SPX itself during the cash session. All indices were slightly down as the tax cut debate continued. The USD picture was mixed. EUR was up, and GBP rallied after breaking resistance at 1.3175, as was CAD, slightly, on very little volatility. However AUD, JPY and Gold were down, as was Oil. 10-year yields continued their disconnect by rising sharply. The weekend sees Mario Draghi speak unexpectedly on Saturday at 1000 and RBA Deputy Governor Guy Debelle speaks in Sydney on Sunday. Otherwise the theme of the week is inflation (CPI) prints, with half the G10 (US, UK, Sweden Eurozone and Canada) all reporting. Monday sees further work on the US tax bill. There is an ‘Open Executive Session’ in the Senate at 2000, and there some further indication of the yes/no positions of the House. There also speeches by Fed Harker at 0010, ECB Constancio at 0900, and BoJ Kuroda at 1745. Tuesday has more Central Bankers, at some point in the day we will hear from outgoing Fed Chair Yellen, ECB Draghi, BoJ Kuroda, and BoE Carney, along with various speeches by other bank members. Also the committee stage of the EU Withdrawal Bill begins in the UK Parliament. If that weren’t enough, we have German and UK inflation, and Eurozone GDP all within a three-hour window. Wednesday focus in on the US, with Retail Sales and CPI being reported together at 1330. UK Unemployment is at 0930, but the key measure will be wage growth, an important determinant of future rate rises. Central Bank speakers include Fed Evans, BoC Wilkins (2345), ECB Lane (0700) and RBA Ellis (0700). Thursday sees the important Australia employment report. The estimate is 15k, lower than last month’s 19.8k (and equivalent to 202k in US terms, whose population is 13.5 times as many). UK Retail Sales is somewhat less important now we have had a rate hike, although we will still be producing our monthly fractal. A new report appears today. ADP have started to produce payroll statistics in Canada, although notably, these figures come two weeks after the official Canadian jobs report. Other than that, we have BoE Governor Carney speaking in a plenary session with other BoE MPC members, Fed Mester at 1410, and ECB and Bank of France Governor Villeroy de Galhau at 1430. Friday’s main release is Canadian CPI. Given other recent data, it would take a very strong print to reverse CAD’s recent decline. Mario Draghi speaks in Germany at 1300, and Fed Williams is expected to speak also. US Congress goes into recess as politicians return to district work for the Thanksgiving Week. The public holiday and potential start of the ‘Santa Rally’ is the following Thursday. Friday is also monthly option expiry day.